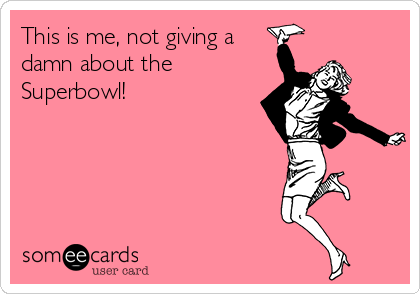 Tomorrow will be the same as all other Super Bowl Sundays for me. 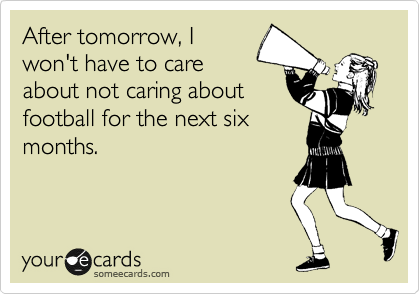 These are the same memes I have posted for the last two years or so saying I will not be watching the game tomorrow. I'm not sure what I will be doing, though reading is a given and I am now trying to get a writing exercise done each day, even if it is just a little. My class resumes this Monday and I will be doing a grab bag of images, similar to the word grab bag I did for my first class. Participants will grab there of four pictures (cut from magazines) and write a piece that includes each of them. Will let you know how it goes. I have less than no interest in sport. Which has led some to classify me as 'unAustralian'. Enjoy your reading and writing. I am looking forward to hearing about your class too.